We paddled down Buffalo Bayou recently to see what we could see. It’s been a hard winter, and the worst flood in history, so it wasn’t glamorous. We did encounter a couple of fish, a lot of trash and mussel shells still, some fallen trees and wayward telephone poles, and numerous examples of expensive landscaping and erosion control projects gone wrong. Note to property owners, public and private: we have slumping on Buffalo Bayou. Banks will slide down and away, especially if you remove trees and vegetation, landscape, irrigate, and build too close to the bank. Not much to be done about slumping, which is vertical erosion. Try to convince your neighbor not to armor their banks with concrete, rubble, or sheet metal, which will only make things worse for you and everyone else. We put in at muddy Woodway in Memorial Park for a trip all the way past the park, the Hogg Bird Sanctuary, and Buffalo Bayou Park, taking out below the Sabine Bridge. It wasn’t easy getting our canoes there. Some cursed coincidence (cold weather?) had caused all kinds of vehicles to break down at the last minute. Where Does All That Sediment Come From? There was still a large amount of sediment piled up high on the banks. Rivers naturally deposit sediment on the banks and floodplain. It’s why floodplains are so fertile. (And why in ancient times people wisely moved out of the way of floods.) But people have been asking where all this sandy sediment comes from. Some of it washes out from landscaping and construction sites and other areas that have been disturbed. But erosion is a natural evolutionary process. 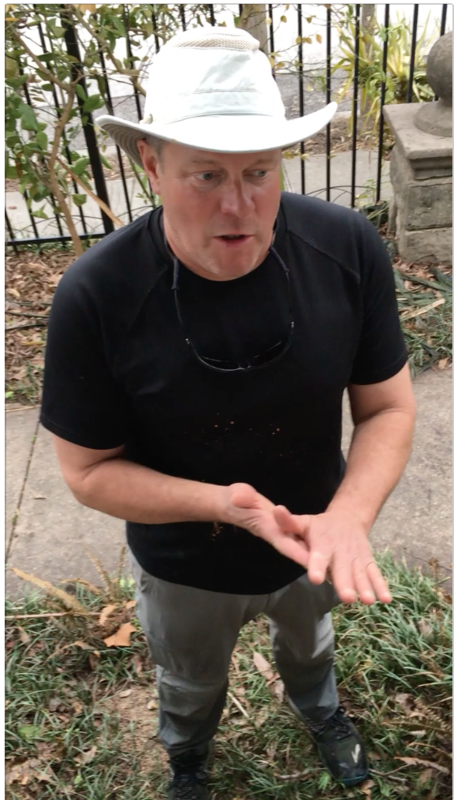 Here is geologist Tom Helm, who was leading our expedition, explaining the origin of sand and the different kinds of sandstone in Buffalo Bayou.